Humphrey Jennings was born in Walberswick, Suffolk on 19 August 1907 and became not only a filmmaker but a photographer, literary critic, theatrical designer, poet, painter and theorist of modern art. While studying English at Cambridge, he designed the first British productions of Stravinsky 's A Soldier's Tale and Honegger 's King David, and founded and edited Experiment with William Empson and Jacob Bronowski . By 1936 he was a leading Modernist and organised the International Surrealist Exhibition in London, along with Herbert Read , Roland Penrose and André Breton . Jennings joined the GPO Film Unit in 1934. His early films, like those of Alberto Cavalcanti (with whom he often collaborated), were criticised by the documentary movement's realists for their experimental qualities, and Geoffrey Nowell-Smith has argued that Jennings ' work is better situated in the context of experimental film and the European avant-garde than within the documentary movement. In 1937 Jennings became involved in another kind of documentary project: the founding of Mass Observation with the anthropologist Tom Harrison and the poet and sociologist Charles Madge . This early attempt at representing popular subjectivity also had a Surrealist tinge, as witnessed by its interest in "shouts and gestures of motorists; the aspidistra cult; anthropology of football pools; bathroom behaviour; beards, armpits, eyebrows" and other unlikely topics. Jennings worked on only one project, May 12th, a collection of observers' reports of Coronation Day 1937, although he himself continued to write regular reports as an observer. Jennings ' own films, like those of European documentarists Joris Ivens , Henri Storck and Jean Rouch , discover the surreal in the everyday as opposed to the artistically contrived. As he put it: "to the real poet the front of the Bank of England may be as excellent a site for the appearance of poetry as the depths of the sea". Like André Breton , he agreed that Surrealism had replaced the 'apparition' with the 'coincidence'. For Jennings , coincidences "have the infinite freedom of appearing anywhere, anytime, to anyone: in broad daylight to those whom we most despise in places we have most loathed: not even to us at all: probably least to petty seekers after mystery and poetry on deserted sea-shores and in misty junk-shops." Jennings employed his Surrealist imagination in his observation of working-class leisure pursuits in pre-war Britain in Spare Time (1939). With its intermittent, minimalist commentary, a music track that often bears little obvious relationship to the images, and a perfunctory, snapshot-like mise-en-scène, the film is a far cry from the realism of a documentary such as Housing Problems (d. Arthur Elton/Edgar Anstey 1935) and was disliked by the documentary traditionalists, who mistook its refusal to ennoble its working-class subjects as an attempt to satirise them. For Jennings , the sights and sounds of wartime Britain were especially rich in 'coincidences', as the landscape itself had undergone radical metamorphosis, and his finest wartime works present us with a Britain both strange and familiar. But he was by no means simply a recorder of striking images, with the help of his regular editor, Stewart McAllister (who received co-directorial credit on Listen to Britain , 1942) he was able to assemble those images with remarkable imaginative power. As he put it in Pandaemonium, a vast, Walter Benjamin -esque collage of quotations from the Industrial Revolution: "just as the usual history does not consist of isolated events, occurrences - so this 'imaginative history' does not consist of isolated images, but each is in a particular place in an unrolling film.". Pandaemonium also includes a passage from the physicist Michael Faraday describing the sight of a balloon rising, in which he remarks how the beauty of the scene derives from "the combination of many effects, each utterly insensible alone, into one sum of fine effect." It is precisely the combination of sounds and images in Jennings ' wartime films which makes them so powerful. The most famous example of the power of his associative montage is provided by the commentary-less Listen to Britain , an extraordinarily poetic evocation of daily life in Britain at war, but also very striking is Words for Battle (1941), in which images of wartime Britain are imaginatively counterpointed on the soundtrack by passages from Milton , Blake , Browning , Kipling and others. 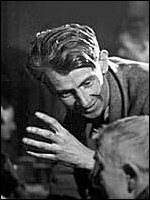 His feature length dramatised documentary, Fires Were Started (1943), is equally resonant but also broke new ground for Jennings in its use of a fictional narrative; in addition it is a remarkably authentic picture of London during the blitz and depicts its working-class characters in a notably unpatronising and naturalistic fashion, as does The Silent Village (1943), Jennings ' sombre re-creation of the destruction by the Nazis of the Czech village of Lidice. Watching Jennings ' films, it's hard not to be reminded of E.M. Forster 's dictum: 'only connect'. And, significantly, it was Forster who wrote the commentary of A Diary for Timothy (1945), the last of Jennings ' major works. Again, much of the meaning of the film is carried by its structure, although in a way that never draws attention to itself. Jennings paints a highly complex picture of life in Britain during the final year of the war, focusing on the personal lives of various representative characters and on the wider wartime context, utilising the form of a diary covering a baby's first year of life. Especially striking is the way in which he uses commentary not as the omniscient, explicatory 'voice of truth' but in a ruminative, questioning way and the images do not so much illustrate it as engage with it in dialogue. The clatter of clogs in the Lancashire mill towns, the to-and-fro of lorries on the Great North Road, the queues outside the Labour Exchanges, the rattle of pin-tables in Soho pubs, the old maids biking to Holy Communion through the mists of the autumn morning - all these are not only fragments, but characteristic fragments, of the English scene. How can one make a pattern out of this muddle? Jennings ' films provide one answer to this question. It is particular to its time and has nothing of the bleak social critique of a later documentarist like Mike Grigsby ; but it is no less powerful and moving, and the question itself remains as pressing today as when it was first posed. Humphrey Jennings died on 24 September 1950 in an accident in Greece, while preparing for a film for the European Economic Commission.